Gene variants that disrupt TCR signaling can cause severe immune deficiency, yet less disruptive variants are sometimes associated with immune pathology. Null mutations of the gene encoding the scaffold protein Src homology 2 domain–containing leukocyte protein of 76 kDa (SLP-76), for example, cause an arrest of T cell positive selection, whereas a synthetic membrane-targeted allele allows limited positive selection but is associated with proinflammatory cytokine production and autoantibodies. Whether these and other enigmatic outcomes are due to a biochemical uncoupling of tolerogenic signaling, or simply a quantitative reduction of protein activity, remains to be determined. In this study we describe a splice variant of Lcp2 that reduced the amount of wild-type SLP-76 protein by ∼90%, disrupting immunogenic and tolerogenic pathways to different degrees. Mutant mice produced excessive amounts of proinflammatory cytokines, autoantibodies, and IgE, revealing that simple quantitative reductions of SLP-76 were sufficient to trigger immune dysregulation. This allele reveals a dose-sensitive threshold for SLP-76 in the balance of immunity and immune dysregulation, a common disturbance of atypical clinical immune deficiencies. Exome sequencing has revealed that our protein-coding genomes are spectacularly diverse, with new variants emerging in every generation (1). Many of these variants have no effect on the proteins they encode, whereas others inactivate them completely. The remainder fall between these two extremes and lead instead to qualitative or quantitative effects on protein function. In the context of the immune system, we have learned a great deal from the study of null alleles in mice, and we continue to do so with the rapid expansion and systematic phenotyping of public knockout mouse resources (2). However, we understand far less about variants with intermediate effects, despite their frequency and capacity to cause or modify human disease. Ag recognition by the TCR is a case in point, where null alleles in mice and humans have allowed a fine dissection of the pathway (3). Absence of the proximal kinase ZAP-70, for example, disrupts thymic positive selection and peripheral T cell activation, leading to severe immune deficiency in mice and in humans (4–7). More enigmatic is the outcome of missense variation in ZAP-70, which in several cases displays paradoxical associations between immune deficiency and autoimmune pathology (8, 9). The Zap70W163C variant in mice, for example, impairs TCR signaling and positive selection, yet in the correct genetic and environmental context will cause autoimmune arthritis (8, 10). The use of an allelic series of hypomorphic Zap70 variants has established that immune dysregulation can result from stepwise reductions in ZAP-70 activity (9, 11–14), likely due to its differential contribution to immunity versus tolerance. As another example, deficiency of the transmembrane adapter protein linker for activated T cells (LAT) blocks T cell development in mice (15), yet missense mutations that prevent binding of phospholipase C-γ1 (LATY136F) or Grb2 and Grap (LATY175/195/236F) lead to lymphoproliferative disorders (16–18) dependent in the former case on RasGRP1-ERK signaling (19). These alleles collectively illustrate that both biochemical separation of function and quantitative loss of function mutations in a single pathway can lead to similar pathological outcomes (20). A third critical node of proximal TCR signaling is controlled by the adapter protein Src homology 2 domain–containing leukocyte protein of 76 kDa (SLP-76) (21), encoded in mice by the lymphocyte cytosolic protein 2 (Lcp2) gene. 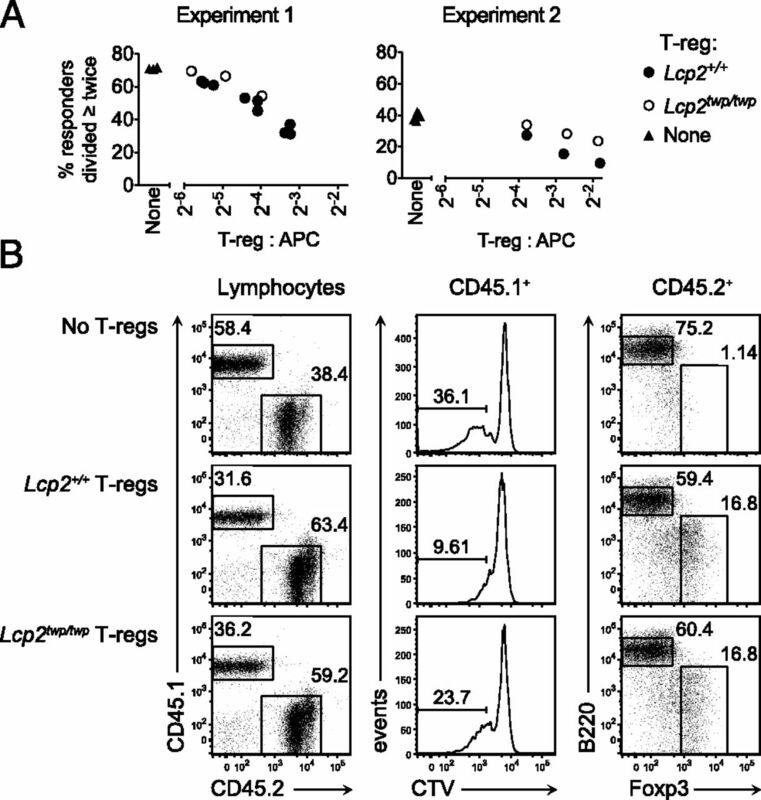 Null alleles of Lcp2 prevent T cell development at an equivalent stage to LAT (22, 23), whereas a synthetic membrane-targeted version is associated with inflammatory cytokine production and autoantibodies (24). It is not clear whether this association is the result of a biochemical separation or acquisition of function in SLP-76, or whether it is due to a form of quantitative reduction in function similar to ZAP-70 (9). In this study we describe a splice variant of Lcp2 that reduced the quantity of wild-type SLP-76 protein by ∼90%. Homozygous mutants displayed a partial block in thymocyte development, with further impairments in negative selection and regulatory T cell development. Mutant mice developed spontaneous Th1-biased effector T cells, accompanied by autoantibodies and elevated IgE and IgG1. The physiological outcomes of this mutation establish SLP-76 as a dose-sensitive node in the balance between immunity and immune dysregulation. The Lcp2twimp strain (MGI:3614800) was generated from a C57BL/6 male that received three weekly doses of 100 mg/kg N-ethyl-N-nitrosourea. Mutagenesis, mapping, and sequencing methods have been described previously (25), as have 3A9 TCR transgenic (26), KLK4 H-2Kb:mHEL transgenic (27), NOD.H2k (28), Foxp3tm1.1Ayr (29), Foxp3tm2Ayr (Foxp3gfp) (30), and C57BL/6.Ly5a congenic mice. Lcp2twp/twp H2k mice were generated by breeding C57BL/6 Lcp2twp/twp (H2b) mice with B10.BR (H2k) mice and intercrossing F1 hybrids. Mice were housed in specific pathogen-free conditions at the Australian Phenomics Facility and Australian Cancer Research Facility (John Curtin School of Medical Research), with all animal procedures approved by the Animal Ethics and Experimentation Committees of the Australian National University and University of Newcastle. Lymphoid organ suspensions were prepared and stained with a combination of FITC-conjugated anti-CD4 (GK1.5), anti-CD44 (IM7), anti-CD69 (H1.2F3), anti-CD3ε (145-2C11), and anti-TCRβ (H57-597); PE-conjugated anti-CD25 (7D4), anti-GITR (DTA-1), and anti-CD5 (53-7.3); PerCP-conjugated anti-CD8 (53-6.7); biotinylated anti-Vβ5 (MR9-4), anti-Vβ11 (RR3-15), and anti-TCRβ (H57-597); allophycocyanin- or Qdot605-conjugated streptavidin; allophycocyanin-conjugated anti-CD45.1 (A20) and anti-CCR7 (4B12); PE-Cy7–conjugated anti-CD24 (M1/69) and anti-CD8 (53-6.7); and Alexa Fluor 700–conjugated anti-CD4 (GK1.5). Intracellular calcium after stimulation with anti-CD3ε (500A2) was measured using a mixture of Ly5-marked wild-type and mutant splenocytes labeled with Indo-1 (Molecular Probes). In some experiments, splenocytes were stimulated for 4 h at 37°C in complete medium containing PMA (50 ng/ml), ionomycin (1 μM), and GolgiStop (1:1500 [v/v]). Intracellular staining with anti–Foxp3-FITC (FJK-16s), anti–IFN-γ-FITC (XMG1.2), anti–IL-4-PE (11B11), anti–IL-17A-allophycocyanin (eBio17B7), and anti–Helios-Pacific Blue (22F6) was performed using the Foxp3 staining buffer set (eBioscience) as per the manufacturer’s instructions. 3A9 TCR–bearing cells were identified by labeling cells with the clonotype-specific 1G12 hybridoma supernatant, followed by rat anti-mouse IgG1-allophycocyanin (A85-1). Whole thymocyte lysates prepared from Lcp2+/+ and Lcp2twp/twp mice were subjected to SDS-PAGE, and Western blots were probed with SLP-76 antiserum raised against an N-terminal peptide of SLP-76 (provided by G. Koretzky) (31). SLP-76 band intensity was measured by ImageJ. Dilute serum (1:100) was incubated on HEp2 ANA slides (Inova Diagnostics), washed, and incubated with FITC-conjugated anti-mouse IgG (Caltag Laboratories). Slides were washed and mounted, and fluorescence was visualized and scored by a blinded individual. Measurement of serum Igs by ELISA was performed as previously described (9). Six- to 8-wk-old mice were i.p. injected with 50 μg OVA and 1 mg Rehydrogel (Reheis) in sterile saline. Mice were then challenged intranasally on days 12, 13, 14, and 15 with 10 μg OVA under isoflurane anesthesia. Mice were sacrificed 24 h following the final challenge and serum was collected by cardiac puncture. IgE was captured on plates coated with rat anti-mouse IgE (BD Biosciences), with total IgE detected by biotinylated rat anti-mouse IgE (BD Biosciences) and streptavidin-HRP (BioSource International), and OVA-specific IgE was detected with biotinylated OVA and streptavidin-HRP (BioSource International). Suppression assays were performed as previously described (32). Briefly, CTV-labeled, FACS-purified CD4+CD44loCD62LhiCD25– splenocytes from CD45.1 mice (“responders”) were cocultured for 68 h in round-bottom 96-well plates with or without FACS-purified CD3–CD4–CD8– splenocytes from Lcp2+/+ CD45.2 mice (APCs) and CD4+GFP+ splenocytes from Lcp2+/+ or Lcp2twp/twp CD45.2 Foxp3gfp mice (regulatory T cells) in the presence of soluble anti-mouse CD3ε at 2 μg/ml. At the start of the culture (day 0) each well contained 1.8 × 104 responders and the responder/APC ratio was either 1:5 or 1:2, held constant within a given experiment, and a range of responder/regulatory T cell ratios were used, namely 1:1, 1:0.5, or 1:0.25 in each experiment. Unfractionated splenocytes (∼3 × 107) were administered to 1- or 4-wk-old recipient mice by i.p. injection. Serum was collected 5–6 wk posttransfer for the measurement of IgG autoantibodies, IgE and IgG1. For adoptive transfer of regulatory T cells, CD45.1+Foxp3−/−Rag1−/− females were bred with CD45.1 C57BL/6 males to produce Foxp3–/Y mice, which were injected i.p. at either 1 or 7 d after birth with 1.25–2 × 105 FACS-sorted GFP+ splenocytes from Lcp2+/+ or Lcp2twp/twp CD45.2 Foxp3gfp donor mice in 40 μl PBS. Recipients were analyzed at 19 or 28 d after birth. In a genome-wide N-ethyl-N-nitrosourea screen for regulators of lymphocyte development (33), we identified several related individuals from a single pedigree with reduced frequencies of peripheral blood T cells and increased expression of the activation marker CD44 (Fig. 1A–C). This phenotype, nicknamed “twimp” (twp), was inherited as a simple recessive Mendelian trait on a C57BL/6 background and when outcrossed to a NOD.H2k mapping strain (Fig. 1A). Identification and mapping of the twimp mutation. (A) Initial generations of the twimp pedigree showing individuals that were affected (filled), unaffected (open), or not typed (cross) for the T cell phenotype. (B) Definition of the twimp phenotype by CD4+ and CD8+ cell frequency in blood. (C) Representative flow cytometry profiles measuring frequencies of CD4+ and CD8+ cells, and histogram overlays comparing expression of CD44 on CD4+ and CD8+ cells in lymph nodes. (D) Fine mapping of the twimp mutation on chromosome 11. Haplotypes of individual twimp affected mice are shown in columns: C57BL/6 homozygote (▪); C57BL/6- NOD.H2k heterozygote or NOD.H2k homozygote (□). Numbers of individual mice with each haplotype are indicated at the base of each column. (E) Amplified genomic DNA from twimp mice was used to sequence Lcp2, revealing a T to G transversion within intron 12. (F) Representative location of the twimp mutation in Lcp2 and its effect on Lcp2 RNA processing: sequencing of twimp cDNA revealed the presence of two transcripts, one full-length and a second that lacked exon 12. Right panel shows the products of a PCR reaction (forward primer in exon 9, reverse in exon 13) performed on splenic cDNA from C57BL/6J and twimp mice. (G) Schematic representation of the SLP-76 protein and the coding contribution of each exon, with the exon deleted in twimp (e12) shown in black. Expression of SLP-76 protein was measured by probing thymocyte lysates from with a polyclonal anti–SLP-76 Ab. SAM, sterile α motif; SH2, Src homology 2; YYY, tyrosines 112/128/145. To establish the chromosomal location of the twimp mutation we outcrossed twimp males (C57BL/6 background) to NOD.H2k females and intercrossed the resulting F1 offspring (Fig. 1A). 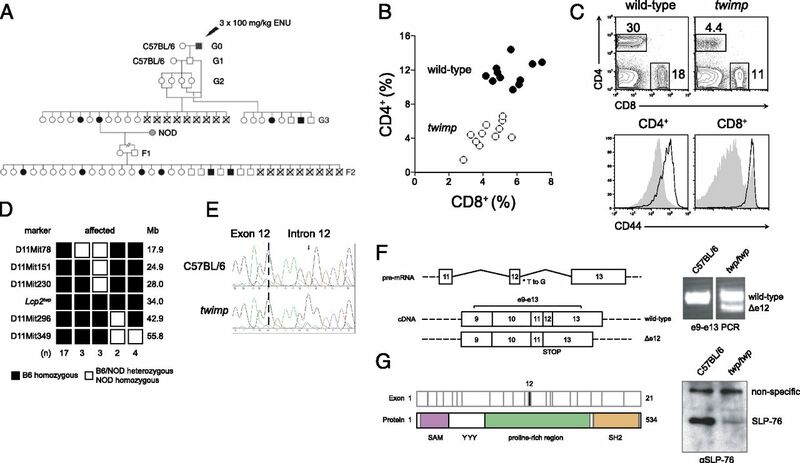 From nine intercross breeder pairs, 152 offspring were screened for peripheral T cell deficiency and increased expression of CD44 by flow cytometry. Thirty-two individuals (21%) exhibited the twimp phenotype. Broad chromosomal linkage localized the mutation to an interval on chromosome 11, with fine mapping reducing the interval to between D11Mit230 (27.90 Mb) and D11Mit296 (43.63 Mb) (Fig. 1D). Within this interval lay Lcp2, the gene encoding SLP-76. Lcp2 was a strong candidate for the twimp mutation, as SLP-76–deficient mice exhibit severe defects in T cell development (22, 23). After sequencing all coding exons and flanking splice junctions of Lcp2, we identified a single intronic base substitution between C57BL/6 wild-type and twimp mice (Fig. 1E). The T to G transversion was located four bases downstream of the conserved “GU/T” sequence, within the intronic splice donor site of intron 12. Amplification and sequencing of Lcp2 cDNA from twimp splenocytes revealed the presence of both wild-type transcript and an aberrant transcript lacking exon 12 (Fig. 1F). The absence of exon 12 is predicted to lead to a reading frame shift, introducing a premature termination codon within exon 13 (Fig. 1F). This was reflected by a reduction of full-length SLP-76 protein expression in Lcp2twp/twp thymocytes (Fig. 1G), with the Western blot band intensity estimated to be ∼10% that of wild-type. We detected no low m.w. proteins using the same anti–SLP-76 antiserum raised against aa 136–235 (not depicted) (31), suggesting that the Δe12 splice product (or any other cryptic products) was not translated. Lcp2twp/twp thymi were consistently of lower cellularity than in wild-type littermates, with significantly fewer double-positive (CD4+CD8+), CD4 single-positive (SP; CD4+CD8−), and CD8SP (CD4−CD8+) cells compared with Lcp2+/+ controls (Fig. 2A, 2B). Within the CD4−CD8− (double-negative [DN]) thymocyte subset, Lcp2twp/twp mice had increased proportions and total numbers of DN3 (CD44−CD25+) cells, with fewer DN4 (CD44−CD25−) cells (Fig. 2C, 2D), consistent with a defect in thymic β-selection. This partial block in T cell development was also apparent in the periphery, with Lcp2twp/twp mice showing reduced numbers of CD4+, but not CD8+, splenic T cells (Fig. 2E, 2F). 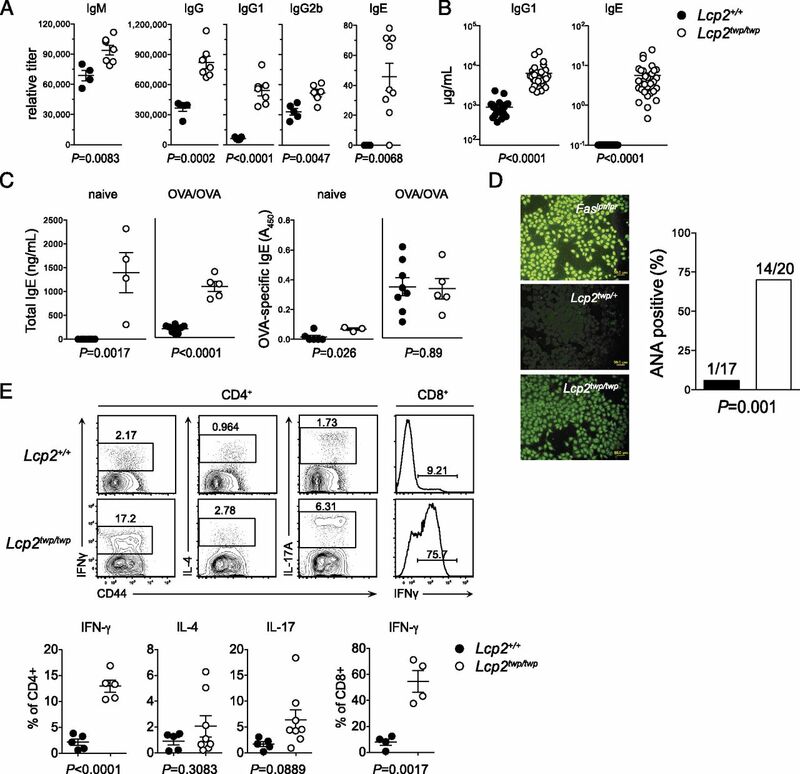 Impaired development and function of Lcp2twp/twp T cells. (A) Representative flow cytometry plots of CD4 and CD8 expression on thymocytes from Lcp2+/+ and Lcp2twp/twp mice, showing frequencies of each subset. (B) Absolute numbers of DN (CD4−CD8−), DP (CD4+CD8+), CD4SP (CD4+CD8−), and CD8SP (CD4−CD8+) thymocytes. (C) Representative flow cytometry plots of CD25 and CD44 expression on DN (CD4−CD8−) thymocytes from Lcp2+/+ and Lcp2twp/twp mice, resolving DN1 (CD44+CD25−), DN2 (CD44+CD25+), DN3 (CD44−CD25+), and DN4 cells (CD44−CD25−). (D) Absolute numbers of DN1–DN4 thymocytes. Representative flow cytometry plots showing percentages (E) and absolute numbers (F) of CD4+ and CD8+ splenic lymphocytes. (G) Representative histogram overlays of CD69, CD5, TCRβ, and CD3ε expression on DP thymocytes from Lcp2+/+ (filled, gray) and Lcp2twp/twp (open, red) histograms. Data are representative of (A, C, E, and G) or pooled from (B, D, and F) two independent experiments. Symbols represent individual mice; bars represent mean and SE. The p values were calculated by a two-tailed unpaired Student t test. During thymic positive selection the expression of CD5 increases, correlating positively with TCR signal intensity (34). Whereas CD5 expression was detectable on DP thymocytes from Lcp2+/+ mice, CD5 expression on thymocytes from Lcp2twp/twp mice was significantly lower (Fig. 2G). Positive selection of DP thymocytes also leads to an increase in expression of CD69, TCRβ, and CD3ε. Compared to wild-type controls, expression of CD69, TCRβ, and CD3ε was significantly lower on Lcp2twp/twp DP thymocytes (Fig. 2G). A partial block of Lcp2twp/twp thymocyte development and low expression of CD5, CD69, TCRβ, and CD3ε on DP cells was consistent with a defect in TCR signaling and reduced SLP-76 function. Mixed bone marrow chimeras confirmed that the T lymphocyte deficiency was intrinsic to Lcp2twp/twp cells, as Lcp2twp/twp T cells were at a profound competitive disadvantage to wild-type (not depicted), and mutant peripheral T cells also exhibited severe functional impairments (35). Despite the limited development of Lcp2twp/twp T cells and their impaired activation in vitro, unimmunized Lcp2twp/twp mice produced significantly more IgM, IgG1, IgG2b, and IgE than did their wild-type counterparts (Fig. 3A), with IgG1 and IgE being especially high (Fig. 3B). In the case of IgE, this did not appear to be an exaggeration of Ag-specific responses, because sensitization and challenge of Lcp2twp/twp mice with OVA did not reveal any difference in OVA-specific IgE secretion (Fig. 3C). Elevated serum IgE and IgG1 was also accompanied by IgG autoantibodies against nuclear and cytoplasmic Ags, which were observed in 75% of Lcp2twp/twp mice, but only 6% of wild-type littermates (Fig. 3D). Furthermore, intracellular staining after PMA plus ionomycin stimulation revealed an increased frequency of IFN-γ–producing CD4+ and CD8+ splenocytes in Lcp2twp/twp mice. Although the frequency of CD4+ cells that produced IL-17A appeared elevated compared with wild-type, the difference was not statistically significant (Fig. 3E). Spontaneous immune dysregulation in Lcp2twp/twp mice. (A) Relative titers of serum Igs as measured by ELISA. (B) Replicated IgG1 and IgE concentration measurements. (C) Relative titers of total (left) and OVA-specific IgE (right). OVA/OVA groups were sensitized i.p. and then challenged intranasally with OVA. (D) Representative HEp2 slides incubated with sera from 8- to 15-wk-old Faslpr/lpr (positive control), Lcp2+/twp, or Lcp2twp/twp mice, followed by incubation with anti-mouse IgG-FITC. Scale bars, 50 μm. Bar graph indicates the proportion of 8- to 15-wk-old autoantibody-positive Lcp2+/twp or Lcp2twp/twp mice. (E) Representative flow cytometry plots (top) and frequencies (bottom) of IFN-γ, IL-4, or IL-17 expression in CD4+ and CD8+ splenocytes 4 h after stimulation with PMA and ionomycin. Symbols represent individual mice; bars represent mean and SE. The p values were calculated by a Mann–Whitney U test [(A and B) IgE, (C) total IgE naive, and (D)] or a two-tailed unpaired Student t test (A–C and E). TCRs with high affinity for self are normally purged from the thymocyte repertoire by negative selection, and defects at this stage can permit the escape of self-reactive clones that contribute to the onset of autoimmunity (36). To measure the efficiency of negative selection in Lcp2twp/twp mice, we used an in vivo model of superantigen-mediated deletion (37). Vβ5+ and Vβ11+ T cells that develop in the presence of the class II MHC molecule I-Ek (encoded by the H2k haplotype) and certain endogenous mouse mammary tumor viruses are normally deleted in the thymus by negative selection. However, in the absence of I-Ek (e.g., in mice with the I-Ek–deficient H2b haplotype) these same clonotypes are not deleted (Fig. 4A). In Lcp2twp/twp mice, Vβ5+ and Vβ11+ T cells were inefficiently deleted in the presence of I-Ek (Fig. 4A). CD4+Vβ5+ T cells can also be deleted in an I-Ek–independent manner (38), yet these cells were twice as prevalent in H2b Lcp2twp/twp mice compared with Lcp2+/+ controls (Fig. 4A). Negative selection in Lcp2twp/twp mice. (A) Percentages of CD4+ and CD8+ PBLs that were Vβ11+ or Vβ5+ were compared between H2b and H2k genetic backgrounds. (B) Thymocytes and splenocytes from 3A9 TCR transgenic (TCR+) or 3A9 TCR;mHEL double transgenic (TCR+mHEL+) mice were analyzed by flow cytometry, and absolute numbers of DN (CD4−CD8−), DP (CD4+CD8+), CD4SP (CD4+CD8−), and CD4+1G12+ were calculated (C). (D) Flow cytometry of CD24+Foxp3− thymocytes from wild-type, Lcp2twp/twp, or Zap70mrd/mrt mice showing a gate for the TCRβ+ subset (top), among which the frequency of Helios+ cells was enumerated (bottom). (E) Frequencies of the indicated populations were calculated from the histograms presented in (D). Symbols represent individual mice; bars represent mean and SE. The p values were calculated by a two-tailed unpaired Student t test. In addition to the relatively strong stimulus of superantigen-mediated deletion, we also measured deletion under a clonally-restricted setting using the hen egg lysozyme (HEL) peptide–specific 3A9 TCR transgene (class II restricted). Positive selection was severely impaired in TCR transgenic Lcp2twp/twp mice, in which far fewer clonotype-positive (1G12+) thymocytes and splenocytes were present (Fig. 4B, 4C). To promote negative selection of these cells, the 3A9 TCR transgene was combined with a class I promoter-driven membrane-bound HEL Ag (mHEL). In the presence of both transgenes (TCR+mHEL+), wild-type T cells are primarily deleted at the DP stage in the thymus, reducing DP numbers by ∼99% and leaving very few clonotype-positive cells in the thymus or spleen (Fig. 4B, 4C). Numbers of DP thymocytes were substantially higher in Lcp2twp/twp mice (Fig. 4C), suggesting an impairment of negative selection. Upon closer examination, however, the remaining DP, CD4SP, and CD4+ cells did not express the 1G12-reactive TCR transgene clonotype (Fig. 4B, 4C), implying that negative selection was intact in this model. A component of the thymocyte negative selection response that accompanies strong but not weak TCR signaling, and is separable from apoptosis, is upregulation of the Helios transcription factor (39). Using a CD24+Foxp3− gate to exclude CD24− mature thymocytes and Foxp3+ regulatory T cells, Lcp2twp/twp mice showed a 90% reduction in the frequency of TCRβ+ thymocytes, consistent with the severe defect in αβ T cell positive selection described above. However, the frequency of Helios+ thymocytes within the small CD24+Foxp3−TCRβ+ population in Lcp2twp/twp mice was increased relative to wild-type (Fig. 4D, 4E). Consistent with a requirement for TCR signaling in upregulation of Helios, Zap70mrd/mrt mice analyzed in parallel exhibited a decreased frequency of Helios+ cells within their small CD24+Foxp3−TCRβ+ thymocyte population (Fig. 4D, 4E). These effects on Helios+ cell frequencies were of similar magnitude in the immature CCR7− and semimature CCR7+ subsets of TCRβ+ thymocytes (data not shown). Thus, whereas these two mutations cripple both positive selection and clonal deletion in the thymus to similar degrees, a substantial fraction of nascent TCRβ+ Lcp2twp/twp thymocytes show evidence of registering a strong ZAP-70–dependent TCR signal as determined by Helios upregulation. A second mode of thymus-acquired tolerance is the selection and activity of Foxp3+ regulatory T cells (40). 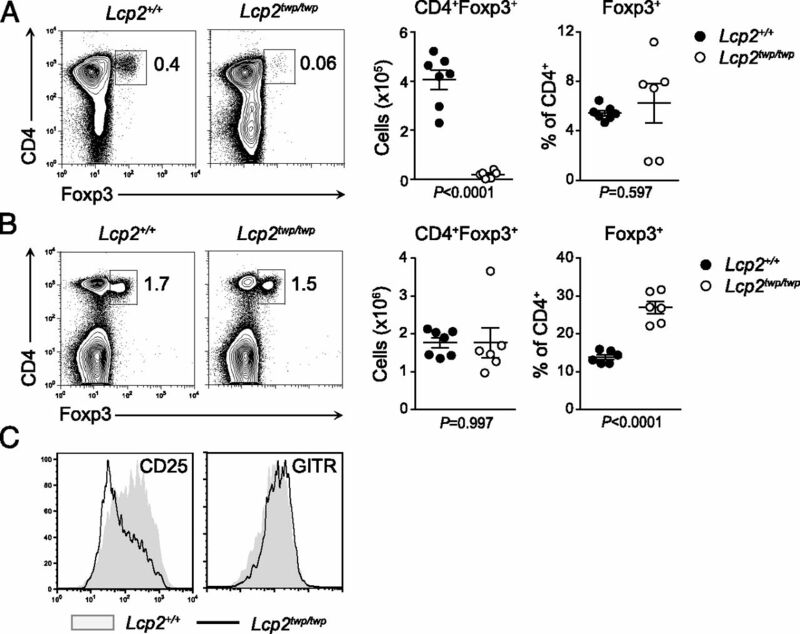 Numbers of CD4+Foxp3+ thymocytes were reduced in Lcp2twp/twp mice (Fig. 5A), yet splenic CD4+Foxp3+ cells were present in equivalent numbers and represented a greater proportion of total CD4+ cells (Fig. 5B). Expression of the IL-2 receptor α-chain (CD25), but not the activation marker GITR, was also reduced on CD4+Foxp3+ splenocytes in Lcp2twp/twp mice (Fig. 5C). To test the suppressive function of Lcp2twp/twp regulatory T cells, and to avoid complications of reduced CD25 expression, we sorted CD4+GFP+ cells from wild-type and mutant Foxp3gfp reporter mice. After an initial experiment suggested a subtle suppression defect for Lcp2twp/twp regulatory T cells, we repeated the experiment using fewer APCs. Under the latter conditions of reduced Ag presentation, a clear defect in suppression by Lcp2twp/twp regulatory T cells was revealed (Fig. 6). Because IL-2 is critical for the survival of regulatory T cells (41), this reduction in CD25 expression, together with an imbalance between thymic output and peripheral numbers, may disrupt regulatory T cell function and contribute to dysregulated Ab production. Development of Foxp3+ cells in Lcp2twp/twp mice. Representative flow cytometry plots and absolute numbers of CD4+Foxp3+ thymocytes (A) or splenocytes (B). (C) Representative histogram overlays of CD25 and GITR expression upon CD4+Foxp3+ splenic lymphocytes from Lcp2+/+ (filled) and Lcp2twp/twp (open) mice. Symbols represent individual mice; bars represent mean and SE. The p values were calculated by a two-tailed unpaired Student t test. Impaired function of Lcp2twp/twp Foxp3+ cells. (A) Proliferation of FACS-purified CD4+CD44loCD62LhiCD25− responders (CD45.1) after 68 h of stimulation with soluble anti-CD3. Responders were cultured in the presence of FACS-purified CD3–CD4–CD8– cells (APCs, C57BL/6, CD45.2) and CD4+GFP+ cells (regulatory T cells, CD45.2) from Lcp2+/+ or Lcp2twp/twp Foxp3gfp mice. (B) Flow cytometry plots from experiment 2 (regulatory T cell/APC ratio of 2−2). Spontaneous production of IgE and IgG1 Abs and IgG autoantibodies would commonly be suspected to arise from a dysregulation of helper T cell activity. In the case of Lcp2twp/twp mice, impaired negative selection may allow the persistence and activation of autoreactive T cells, as would a disruption of Foxp3+ regulatory T cell activity. T cell lymphopenia in Lcp2twp/twp mice could also contribute to T cell hyperactivity through the excessive provision of survival factors such as IL-7, which oppose the upregulation of proapoptotic Bim by high-affinity TCR signals (42). During T cell lymphopenia IL-7 would be available in excess, increasing the amount of survival signal per cell and allowing the inappropriate survival and activation of self-reactive T lymphocytes. To establish which of these cis- or trans-acting alternatives, if any, could explain immune dysregulation in Lcp2twp/twp mice, we adoptively transferred wild-type splenocytes into young Lcp2twp/twp recipients. Five weeks after transfer, serum IgE and IgG1 Abs were both significantly reduced, indicating that a trans-acting mechanism was sufficient for the correction of immune dysregulation (Fig. 7A). Correction of Lcp2twp/twp serological phenotypes by adoptive transfer of Lcp2+/+ splenocytes. (A) One- to 4-wk-old Lcp2twp/twp mice received i.p. injections of ∼3 × 107 whole splenocytes from Lcp2+/+ donors (Lcp2twp/twp [+/+ i.p.]) or did not receive any donor splenocytes (Lcp2twp/twp, Lcp2+/+). Recipients were sacrificed 5 wk posttransfer and serum was assayed for the presence of IgE and IgG1 Abs. (B and C) CD45.2+ Lcp2twp/twp mice aged 6–11 wk were left unmanipulated or were injected i.v. with ∼2 × 107 splenocytes from CD45.1+ Foxp3+/Y or Foxp3−/Y littermate mice aged 2–3 wk. Peripheral blood was collected 3–6 wk after adoptive transfer, and serum IgE concentration was measured by ELISA [shown in (B)] and is plotted as a function of the frequency of CD45.1+ donor cells among CD4+ cells [in (C)]. (D) Foxp3–/Y mice (CD45.1) were injected i.p. at 1 or 7 d of age with 1.25–2 × 105 FACS-sorted GFP+ splenocytes from Lcp2+/+ or Lcp2twp/twp Foxp3gfp donors (CD45.2), with donor CD4+ engraftment measured at 19 or 28 d of age. Results are pooled from two independent experiments. Symbols represent individual mice; bars represent mean and SE. The p values were calculated by a Kruskal–Wallis test followed by Dunn’s multiple comparison test [(A) IgE], or one-way ANOVA followed by Bonferroni’s multiple comparison test [(A) IgG1]. Given their mode of action and reduced in vitro suppressive activity, we hypothesized that Foxp3+ cells might account for the correction of Ab secretion after adoptive transfer. Transfer of splenocytes from Foxp3-deficient mice did not lead to a reduction in IgE titers (Fig. 7B), consistent with a need for Foxp3+ regulatory T cells to suppress the excessive production of IgE in Lcp2twp/twp mice. However, donor chimerism in the CD4+ compartment was also less when Foxp3-deficient splenocytes were transferred, and it was negatively correlated with serum IgE (Fig. 7C), supporting the notion that CD4+ cells were responsible for the trans-acting suppression of IgE. To directly test the consequences of adoptive transfer of Foxp3+ cells, we sorted and injected cells from Foxp3gfp reporter mice into Foxp3-deficient recipients. Whereas wild-type Foxp3+ cells engrafted successfully, those from Lcp2twp/twp donors did not (Fig. 7D). This revealed that in addition to their impaired suppressive function, Lcp2twp/twp regulatory T cells were also poor engrafters. Each of us carries an abundance of rare and common variants in protein-coding genes, but we know little about which of these affect protein function. We know even less about the physiological consequences of such variants, which can often affect biological pathways in unpredictable ways. TCR signaling is one such pathway (20), and our analysis in the present study reveals that a purely quantitative reduction of SLP-76 protein can disrupt immunity and tolerance to different degrees, resulting in immune dysregulation. The Lcp2twimp phenotype is clearly distinct from an exon 1 deletion of Lcp2 (22, 23) where thymic development does not progress beyond the DN3 stage. It also differs from mice with phenylalanine substitutions at key tyrosine residues (Y145 or Y112/128), where a predicted disruption of Itk (in the case of Y145F) or Vav1 regulation (in the case of Y112/128F) leads to less severe positive selection defects and no indication of immune dysregulation (43, 44). This would suggest that a simple uncoupling of Vav1 or Itk pathways cannot explain the Lcp2twimp phenotype, and that other qualitative or quantitative mechanisms may be responsible. Alternatively, Lcp2twp/twp mice appear more similar to mice with a synthetic variant of SLP-76, in which the membrane-targeting sequence of LAT is fused to full-length SLP-76 (45). Similar to Lcp2twp/twp, membrane-targeted SLP-76 mutants have moderate T cell lymphopenia and spontaneously produce autoantibodies, with peripheral T cells skewed toward the Th1 and Th17 lineages (24). These effects did not appear to be the result of skewed thymic selection, because adoptively transferred T cells from mice with a peripherally induced mutation also produced more proinflammatory cytokines. Proinflammatory self-reactive T cells should also promote immune dysregulation in cis, so from our adoptive transfer experiments it would appear that defective negative selection was also not sufficient for excessive Ab production in Lcp2twp/twp mice. Nonetheless, the observation of defective superantigen-mediated deletion (and an increase in the frequency of Helios+ thymocytes) implies that the Lcp2twimp repertoire may be skewed toward higher self-reactivity, which could in turn be a necessary (but not sufficient) factor for immune dysregulation. 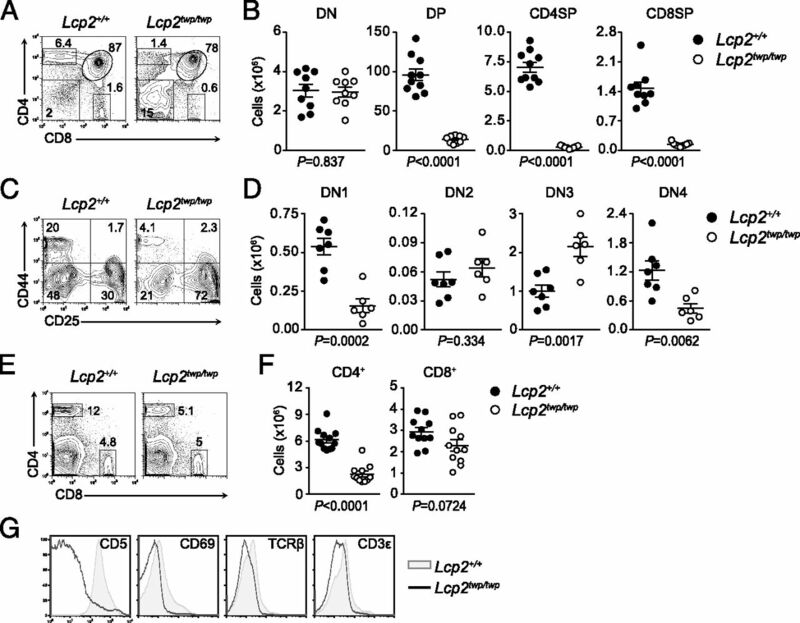 A mechanism that may be consistent between membrane-targeted SLP-76 mutants and Lcp2twimp is the disrupted development and activity of Foxp3+ regulatory T cells. In both instances the proportion of CD4+ cells that express Foxp3 was increased, yet expression of the IL-2 receptor α-chain (CD25) was diminished. CD4+CD25+ cells from membrane-targeted mutants were as suppressive or less suppressive than were wild-type cells in vitro, although the combined function of all Foxp3+ cells (CD25hi and CD25lo) was not determined as they were in our experiments (24). IL-2 and the IL-2R α-chain (CD25) are both known to be essential for peripheral regulatory T cell homeostasis (41, 46, 47), making reduced CD25 expression a potential contributing factor to immune dysregulation in Lcp2 mutants. The trans-acting suppression of Ab production in Lcp2twp/twp mice was also consistent with an impairment of regulatory T cell function, with Foxp3-deficient splenocytes unable to suppress under the same conditions. How, then, might a quantitative reduction in SLP-76 protein disrupt regulatory T cell function? It is clear that thymic selection of CD4+Foxp3+ cells is dramatically reduced (perhaps due to an impairment of TCR signaling), yet their numbers are equivalent in the periphery. This extensive proliferative expansion from a limited pool of thymic emigrants may exhaust or restrict regulatory function, and it might also account for the reduced expression of CD25 on peripheral Lcp2twp/twp Foxp3+ cells. It is also consistent with other findings that homeostatic expansion of Foxp3+ cells is independent of TCR signaling, as has been observed in mice with hypomorphic mutations in Zap70 (9). This proposed mechanism appears to be distinct from other variants in TCR signaling associated with immune dysregulation. Zap70mrd/mrt compound heterozygotes, for example, develop a similar combination of elevated IgE, IgG1, and autoantibodies (9). However, reconstituting mice with a mixture of Zap70mrd/mrt and wild-type fetal liver cells did not reduce production of IgE (9). Less clear is the role of regulatory T cells in the pathology of LATY136F mice: whereas transfer of CD4+CD25+ regulatory T cells into neonatal LATY136F mice could prevent pathology (48), transfer of CD4+Foxp3+ cells could not (49). Furthermore, LATY136F pathology does not seem to depend upon thymic selection processes nor an isolated loss of phospholipase C-γ1 binding, as peripheral deletion of LAT can also trigger lymphoproliferative disease (50). Thus, despite falling within the same overarching pathway, variants of ZAP-70, LAT, and SLP-76 appear to cause immune dysregulation by distinct mechanisms. Immune dysregulation is not just a feature of mouse hypomorphic TCR signaling mutants, but it is also a common characteristic of atypical human SCID (51). The genes mutated in atypical SCID are often the same as those in classical SCID (e.g., RAG1, RAG2, ADA, IL2RG, LIG4), although the mutations are typically hypomorphic rather than null. Partial T lymphopenia, elevated IgE, and autoantibodies are all observed in atypical but not classical SCID (51), consistent with their mouse counterparts (20). Given the mechanistic distinctions between three hypomorphic mutants (Zap70, Lat,and Lcp2) within a common pathway (TCR signaling), it is tempting to speculate that the mechanisms of immune dysregulation in atypical SCID patients are more heterogeneous still. Predicting the physiological effects of missense variants such as these will be a critical challenge for the future of human genetics. An even greater challenge will be to predict the effects of combinations of variants, such as compound heterozygous missense mutations at a single locus, or composite heterozygosity or homozygosity for several loci in a common pathway (52). Allelic variation in TCR signal transduction is a key illustration of this challenge, where hypomorphic variants at different points in the pathway can have paradoxical outcomes (20). Studying the effect of null alleles in mice and humans has defined our understanding of physiological gene function, as it has for TCR signaling, and will continue to do so (2). The use of mouse conditional alleles (53) and hypomorphic variants such as Lcp2twimp (54, 55) will complement these efforts and play an important role in understanding the immunological consequences of genetic variation between wild-type and null. We thank Gary Koretzky for the gift of anti–SLP-76 polyclonal Ab, J. Fontenot and A. Rudensky for providing Foxp3tm1.1Ayr and Foxp3tm2Ayr mice, and the staff of the Australian Phenomics Facility for genotyping and animal husbandry. This work was supported by Wellcome Trust Grants 082030/B/07/Z (to C.C.G.) and 100083/Z/12/Z (to O.M.S. ), by National Institutes of Health Grants R01 AI52127 and U54 AI054523 (to C.C.G. ), and by a Program Grant and Australia Fellowship from the National Health and Medical Research Council (to C.C.G.). 2014. Dissecting mammalian immunity through mutation. Immunol. Cell Biol. 92: 392–399.
. 2013. Genome-wide generation and systematic phenotyping of knockout mice reveals new roles for many genes. Cell 154: 452–464. 2002. Signal transduction mediated by the T cell antigen receptor: the role of adapter proteins. Annu. Rev. Immunol. 20: 371–394.
. 1995. Essential role for ZAP-70 in both positive and negative selection of thymocytes. Nature 376: 435–438.
. 1994. Defective T cell receptor signaling and CD8+ thymic selection in humans lacking Zap-70 kinase. Cell 76: 947–958.
. 1994. Human severe combined immunodeficiency due to a defect in ZAP-70, a T cell tyrosine kinase. Science 264: 1596–1599.
. 1994. ZAP-70 deficiency in an autosomal recessive form of severe combined immunodeficiency. Science 264: 1599–1601.
. 2003. Altered thymic T-cell selection due to a mutation of the ZAP-70 gene causes autoimmune arthritis in mice. Nature 426: 454–460.
. 2007. Opposing functions of the T cell receptor kinase ZAP-70 in immunity and tolerance differentially titrate in response to nucleotide substitutions. Immunity 27: 912–926.
. 2010. Graded attenuation of TCR signaling elicits distinct autoimmune diseases by altering thymic T cell selection and regulatory T cell function. J. Immunol. 185: 2295–2305.
. 2011. SLAP deficiency enhances number and function of regulatory T cells preventing chronic autoimmune arthritis in SKG mice. J. Immunol. 186: 2273–2281.
. 2014. A ZAP-70 kinase domain variant prevents thymocyte-positive selection despite signalling CD69 induction. Immunology 141: 587–595.
. 2014. A novel Zap70 mutation with reduced protein stability demonstrates the rate-limiting threshold for Zap70 in T-cell receptor signalling. Immunology 141: 377–387.
. 1999. Essential role of LAT in T cell development. Immunity 10: 323–332.
. 2002. A LAT mutation that inhibits T cell development yet induces lymphoproliferation. Science 296: 2040–2043.
. 2002. Induction of T helper type 2 immunity by a point mutation in the LAT adaptor. Science 296: 2036–2040.
. 2003. LAT regulates γδ T cell homeostasis and differentiation. Nat. Immunol. 4: 999–1008.
. 2013. 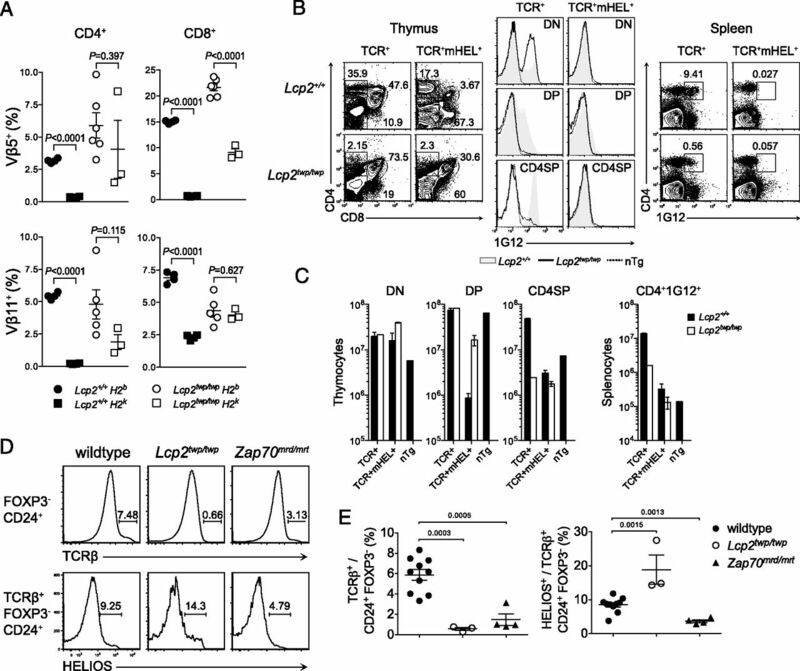 A phospholipase C-γ1-independent, RasGRP1-ERK-dependent pathway drives lymphoproliferative disease in linker for activation of T cells-Y136F mutant mice. J. Immunol. 190: 147–158.
. 2008. Unravelling the association of partial T-cell immunodeficiency and immune dysregulation. Nat. Rev. Immunol. 8: 545–558.
. 2010. Coordination of receptor signaling in multiple hematopoietic cell lineages by the adaptor protein SLP-76. Cold Spring Harb. Perspect. Biol. 2: a002501.
. 1998. Impaired viability and profound block in thymocyte development in mice lacking the adaptor protein SLP-76. Cell 94: 229–238.
. 1998. Requirement for the leukocyte-specific adapter protein SLP-76 for normal T cell development. Science 281: 416–419.
. 2010. Mislocalization of SLP-76 leads to aberrant inflammatory cytokine and autoantibody production. Blood 115: 2186–2195.
. 2002. Analysis of an ethylnitrosourea-generated mouse mutation defines a cell intrinsic role of nuclear factor κB2 in regulating circulating B cell numbers. J. Exp. Med. 196: 1113–1119.
. 1994. Resting and anergic B cells are defective in CD28-dependent costimulation of naive CD4+ T cells. J. Exp. Med. 179: 1539–1549.
. 1991. Elimination from peripheral lymphoid tissues of self-reactive B lymphocytes recognizing membrane-bound antigens. Nature 353: 765–769.
. 2002. Failure to censor forbidden clones of CD4 T cells in autoimmune diabetes. J. Exp. Med. 196: 1175–1188.
. 1998. SLP-76 expression is restricted to hemopoietic cells of monocyte, granulocyte, and T lymphocyte lineage and is regulated during T cell maturation and activation. J. Immunol. 161: 3880–3889.
. 2012. IL-10+ CTLA-4+ Th2 inhibitory cells form in a Foxp3-independent, IL-2-dependent manner from Th2 effectors during chronic inflammation. J. Immunol. 188: 5478–5488.
. 2001. Genome-wide ENU mutagenesis to reveal immune regulators. Immunity 15: 409–418.
. 1998. CD5 expression is developmentally regulated by T cell receptor (TCR) signals and TCR avidity. J. Exp. Med. 188: 2301–2311.
. 2015. T cell expansion is the limiting factor of virus control in mice with attenuated TCR signaling: implications for human immunodeficiency. J. Immunol. 194: 2725–2734.
. 2006. The why and how of thymocyte negative selection. Curr. Opin. Immunol. 18: 175–183.
. 1987. T cell tolerance by clonal elimination in the thymus. Cell 49: 273–280.
. 1994. The induction of peripheral tolerance by the chronic activation and deletion of CD4+Vβ5+ cells. J. Immunol. 152: 4270–4281.
. 2013. Helios marks strongly autoreactive CD4+ T cells in two major waves of thymic deletion distinguished by induction of PD-1 or NF-κB. J. Exp. Med. 210: 269–285.
. 2007. Tracing the action of IL-2 in tolerance to islet-specific antigen. Immunol. Cell Biol. 85: 338–342.
. 2003. The control of apoptosis in lymphocyte selection. Immunol. Rev. 193: 82–92.
. 2008. Complementation in trans of altered thymocyte development in mice expressing mutant forms of the adaptor molecule SLP76. Immunity 28: 359–369.
. 2010. T-cell receptor signals direct the composition and function of the memory CD8+ T-cell pool. Blood 116: 5548–5559.
. 2009. Cutting edge: rescue of pre-TCR but not mature TCR signaling in mice expressing membrane-targeted SLP-76. J. Immunol. 182: 5183–5187.
. 2005. A function for interleukin 2 in Foxp3-expressing regulatory T cells. Nat. Immunol. 6: 1142–1151.
. 2005. Development and function of agonist-induced CD25+Foxp3+ regulatory T cells in the absence of interleukin 2 signaling. Nat. Immunol. 6: 1152–1159.
. 2006. 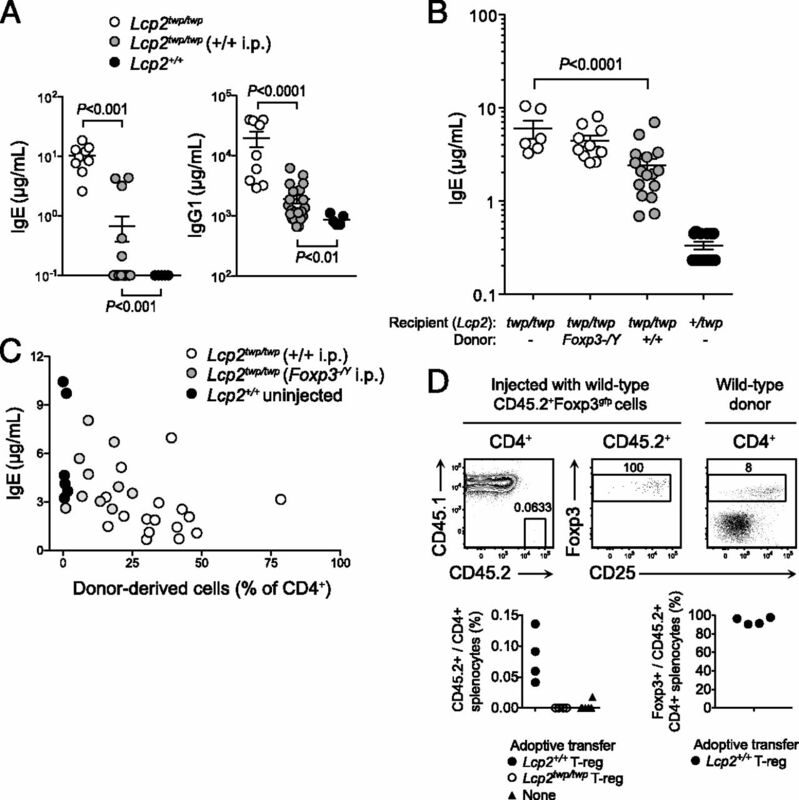 LAT-mediated signaling in CD4+CD25+ regulatory T cell development. J. Exp. Med. 203: 119–129.
. 2008. Th2 lymphoproliferative disorder of LatY136F mutant mice unfolds independently of TCR-MHC engagement and is insensitive to the action of Foxp3+ regulatory T cells. J. Immunol. 180: 1565–1575.
. 2009. Loss of the LAT adaptor converts antigen-responsive T cells into pathogenic effectors that function independently of the T cell receptor. Immunity 31: 197–208.
. 2011. Clinical and immunological manifestations of patients with atypical severe combined immunodeficiency. Clin. Immunol. 141: 73–82.
. 2013. Understanding the immunological impact of the human mutation explosion. Trends Immunol. 34: 99–106.
. 2011. A conditional knockout resource for the genome-wide study of mouse gene function. Nature 474: 337–342.
. 2012. Massively parallel sequencing of the mouse exome to accurately identify rare, induced mutations: an immediate source for thousands of new mouse models. Open Biol 2: 120061.
. 2012. ENU-induced phenovariance in mice: inferences from 587 mutations. BMC Res. Notes 5: 577.